Trooper Matthew B. Brown, a North Carolina State Trooper, is the NCPBA’s 11,000 member. Trooper Brown was born and raised in Kinston, North Carolina. He knew early on that he wanted to do something in the public service field. He enjoyed helping people and serving his community, and is an eagle scout. In high school he started out in the fire service as a volunteer fireman obtaining basic fire-fighting certifications to include firefighter 1 & 2, hazmat, and emergency medical technician certification. After graduating high school, he decided he wanted to pursue the fire service as a career and was soon hired by the City of Kinston Fire and Rescue. After two and a half years into his career, he married Jessica. He enjoyed working as a fireman, but felt as though the Lord was calling him to do something different. During this time, his brother, Joshua Brown, had become a City of Kinston Police Officer and had decided to become a North Carolina State Trooper. After talking and seeing Joshua through this process and the more he learned, the more Matthew felt called to law enforcement. Trooper Brown soon realized that the training and experiences he had as a firefighter and EMT could also be applied and aid him as a Trooper. He learned that the NCSHP had a non-sworn patrol school coming up, which would be the 141st Basic Patrol School. He contacted the recruiter in in his area and began the process for the upcoming school. He went through the extensive selection process and was accepted to begin school in January. However, during Hurricane Matthew, Trooper Brown and his wife lost their home due to the flooding after only being married 4 weeks. During this hardship, he was forced to decline the offer to the 141st Basic Patrol School and was told, due to policy, he would have to wait two years before he could reapply. Trooper Brown felt strongly that the Lord still wanted him to pursue a career as a state trooper, and he was willing to do whatever it took to become a state trooper. 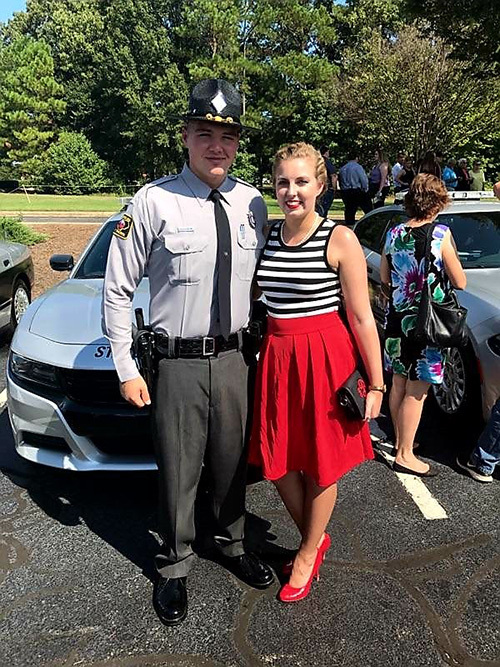 So after finding somewhere for his wife and him to live while dealing with their flooded home, he enrolled in Basic Law Enforcement Training (BLET) at Lenoir Community College. During BLET, the recruiter came to the college and informed his class that the highway patrol was accepting applications for the 142nd Basic Patrol School. Upon learning this, he decided to make an attempt and contacted the Highway Patrol Training Academy. He requested to be allowed to apply to the upcoming school. One week later, the recruiter contacted him and informed him that he would be allowed to apply. After being reprocessed through the selection process, he was accepted for the 142nd Basic Patrol School. He graduated BLET at the end of May, and started Patrol School on June 11th. Trooper Brown went through 15 weeks of the most intense training of his life, both mentally and physically.